One of the places I was really keen to try on my last trip was Yak & Yeti in Disney's Animal Kingdom, having heard great things about the honey chicken there. We were on the Disney Dining Plan, which we had been given free of charge as part of our package booking. We therefore wanted to try as many new Disney restaurants as we possibly could during our two-week vacation, only having ever eaten at Quick Service places before. We had to sit down two months before our holiday with our guidebooks, a notepad and pen, and a spreadsheet on the laptop in order to plan this carefully! Why Yak & Yeti? We are both quite keen on Chinese and Asian food, and wanted to experiment while we were there. After all, it wasn’t going to cost us anything, and in the (unlikely) event we didn’t like something, at least we wouldn’t have paid for it! We spent the day exploring Disney's Animal Kingdom, and at 4:30 pm, it was nearly time for our reservation at Yak & Yeti. We headed over that way, taking our time and enjoying the atmosphere of a nearly empty park (our reservation was at 4:45, and the park closed at 5:00). We checked in and were immediately taken to our table, noticing that the restaurant was rather quiet, but extremely attractive. We loved the décor of Yak & Yeti, it was absolutely fascinating, and once we had been seated, we then nipped off individually to spend a few minutes taking photos and admiring the statues, etc. The furniture and décor was very dark, but this was balanced out with warm-colored walls, and pictures everywhere, and it really suited the restaurant to have this dark furniture. Once seated, we ordered glasses of Sprite, and perused Yak & Yeti's menu. The menus were really well presented, and described the food very well indeed. Service was really quick here, without being too quick. 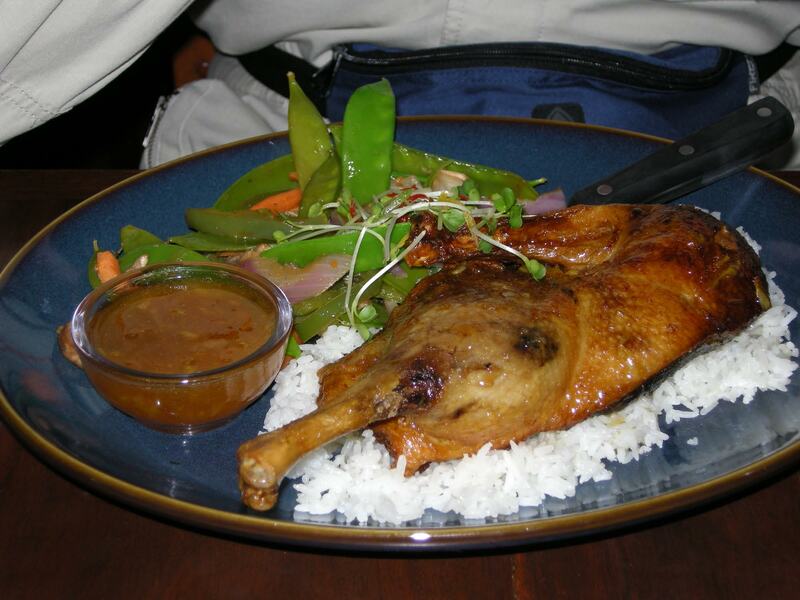 Charlie opted for Duck with Anandapur Glaze; a roasted half duckling with orange wasabi glaze, jasmine rice, and stir-fried vegetables. 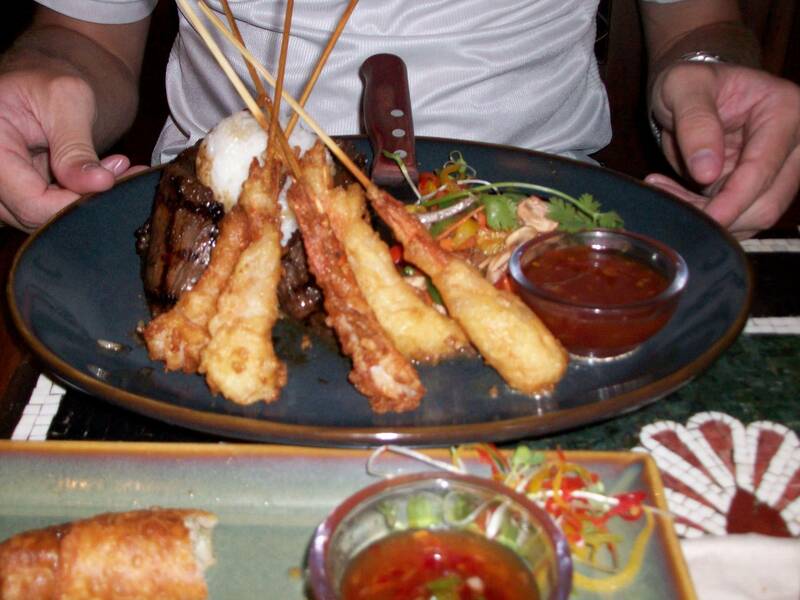 I chose Shaoxing Steak and Shrimp; skirt steak and tempura-battered shrimp with chili plum dipping sauce, jasmine rice, and stir-fried vegetables. When the food arrived, I gave my chili plum dipping sauce to Charlie, as I don’t get on with chili. He loved it! Everything was beautifully presented, it all looked so pretty on the plates, and the food was so tasty – it was extremely high quality. We both loved the jasmine rice (so much so that I had it at another restaurant later in the trip), which was served moulded into a cup shape, and in my case had the shrimp leaning up against it! Charlie said the duck was the best he had ever tasted. He also really loved the orange wasabi glaze on it, which he said complimented the richness of the duck perfectly. My shrimp were huge, and served on wooden skewers, which made them very easy to eat. My steak was excellent, very tender and flavorful. We both struggled to finish all the vegetables, lovely and colourful as they were, as everything else was just so plentiful, and we wanted to save room for dessert. We finished with mango pie, served with fresh whipped cream and a swirl of raspberry sauce. In the words of today's youth, OMG! This was A-MAZING and we could have easily eaten a second serving, had we not been full to bursting! The pie filling was smooth, creamy, and yet tangy -- it really had a "bite" to it. The crust was crunchy and crumbly, and balanced out the smoothness of the filling very well. Yak & Yeti was one of the best meals we'd had so far in our trip, and we definitely would not hesitate to return, even if we have to pay out of pocket for this meal, because it is a very good value for the money - the food was just such excellent quality. As it was, we "paid" with two table service credits and then left a tip. The service was excellent, and we had thoroughly enjoyed our visit to this restaurant. When we left Yak & Yeti, the park was closed and virtually empty, apart from the odd cast member wandering around. It was lovely to slowly stroll out, taking photos as we went. We didn't notice any security guards or cast members following us to encourage us to leave, and no-one hassled us. This was just as well, really, as we were much too full to leave quickly! About the Author: Carolyn lives in the UK, first fell in love with Walt Disney World in 1989, and has visited 10 times since then. She's also made 6 visits to Disneyland Paris. Her dream is to live in a fairytale castle with her handsome prince; failing that, regular visits to any Disney park anywhere in the world will do!